On June 10th, 2014, Duck Down Music and Boot Camp Clik kicked off summer with a free neighborhood BBQ featuring special performances by Buckshot, Smif N Wessun, Sean Price & Rock of Heltah Skeltah, Masta Ace, CJ Fly of Pro Era & more! Duck Down Music is an 18-year old independent music label based in NY, NY, co-founded by Dru Ha & Buckshot. The company has sold over 3.5 million records. Over the last few years, they've released titles from the likes of Sean Price, Talib Kweli, Statik Selektah, 9th Wonder & Buckshot, Pete Rock & Smif N Wessun, Skyzoo & Pharoahe Monch. with 22 album releases, 127 appearances and over 320 artist credits. His lyrical contribution to hip-hop is compared to none. Support the Duck Down family, his family and the culture of hip-hop by keeping his music and legacy alive. Go get the Sean Price "Planet Apes" Audio + 'Songs In The Key Of Price' Mixtape Bundles. New music from Sean Price off his upcoming mixtape, ‘Songs In The Key Of Price,’ out August 21st. Track produced by PF Cuttin. 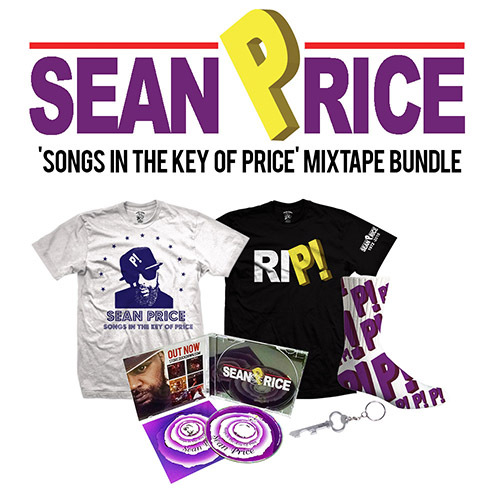 Includes Songs In The Key of Price CD + digital MP3 download, Sean Price ‘Key’ bottle opener, P! socks, Songs In The Key of Price T-shirt, and RIP! T-shirt. The first 100 orders will receive an autographed copy of the Songs in The Key of Price CD.